The first-of-class Oceanographic Research Vessel R/V Neil Armstrong (AGOR 27), successfully completed Acceptance Trials August 7 the Navy reported today. 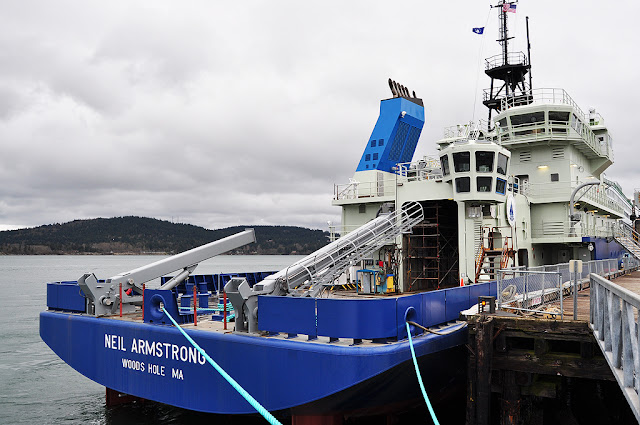 Neil Armstrong is a modern mono-hull research vessel based on commercial design, capable of integrated, interdisciplinary, general purpose oceanographic research in coastal and deep ocean areas. The Navy's Board of Inspection and Survey (INSURV) found the ship to be well-built and inspection-ready. The trials evaluated the ship’s major systems and equipment to include demonstrations of the ship’s main propulsion system, dynamic positioning system, navigation, cranes and winches, and communication systems.